More than one visitor has come to visit Tzfat and fallen under the enchantment of the Old City. The architecture and layout of the Old Jewish Quarter has, on many occasions, been compared to Toledo, Spain. The cobbled streets are narrow and windy, the stone houses seem warm and inviting, and the Quarter has an Old World charm which is quite enchanting. Real estate in the Old City of Tzfat is expensive, but not out of reach, and once potential buyers get a sense of prices, if they decide to continue their hunt for a home, reality sets in. 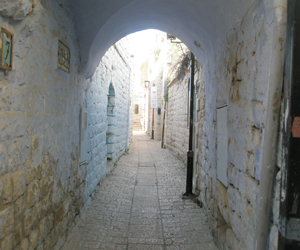 The Old Jewish Quarter of Tzfat is one of the few places in Israel where land is "Tabu", or fully owned by the owner. In most of the country, one technically leases the land where one is buying property - the lease renews automatically every 99 years. However, in the Old City of Tzfat, as well as other sites where Jews lived before the British Mandate of 1918, the ownership deeds are still held by the families which owned the property hundreds of years ago. When a potential buyer finds a property in the Old City that they wish to buy, the first hurdle is to identify the present owners. This generally simple task has ruined countless sales. Many of the owners are impossible to trace, since they are the descendents of the original owners who lived hundreds of years ago. These owners have been traced to Brazil, Australia, South Africa and other far-flung locations, and explaining to them that they have part ownership of a Tzfat ruin can be challenging, much less organizing the sale. In addition, since the original owners lived so many years ago, the properties are today owned by dozens of people, all of whom need to be identified, persuaded to sell, paid and signed for the deal to go through. Oftentimes, some of the owners will agree to sell, but not all, leading to a situation where the buyer succeeds in purchasing a majority percentage of the property, and ends up owning, for example, 75% of the house. That's enough to allow the new owner to live on the property without worrying that someone else could move in, but not enough for them to claim full ownership and receive the coveted "tabu". One local legend tells of a buyer who, in the days before internet, found a house that he wanted to buy. He was worrying about how to track down the various owners when he discovered that a family wedding was planned in Tel Aviv. On the evening of the wedding, he arrived at the wedding hall with a list of the original owner's descendents, many of whom had flown in from throughout the world for the wedding. Over the course of the next several hours, he worked the hall with contracts and a checkbook in hand, and by the end of the night, he owned his house in Tzfat.